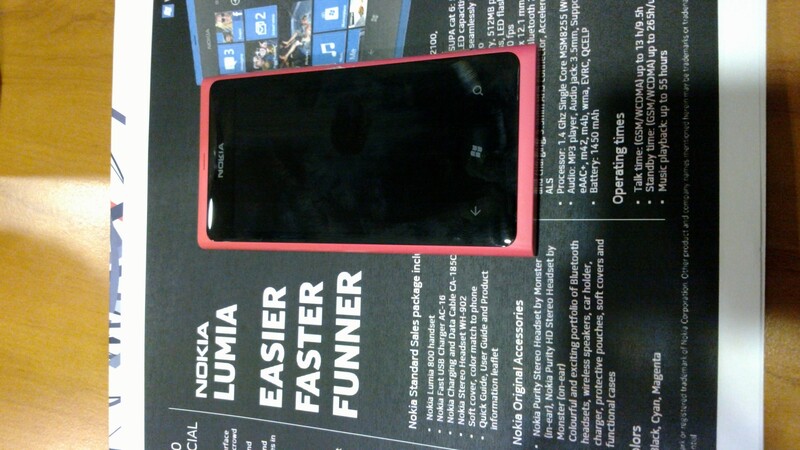 So, a couple of days ago, I received an invite through a “proxy” that allowed me to infiltrate the tightly guarded ranks of Nokia Malaysia during their “preview” of the Lumia 710 & 800 in Kuala Lumpur. 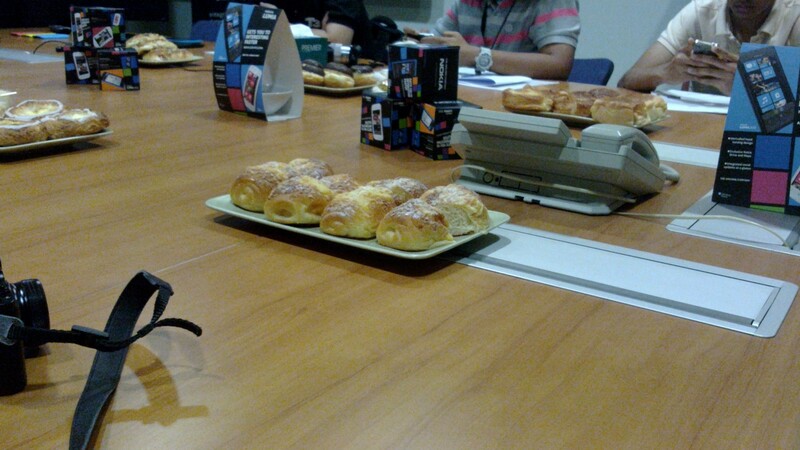 At this launch, my main objective was to eat pastries – as can be seen below. So, besides eating, the “preview” was essentially an in-person press release. A short presentation showcasing the Lumia 800 was quickly followed by a “here you can touch it now” session. This is me touching it. Truth is, if you have a 1.4GHz CPU and don’t have a fast, smooth, responsive UI on a mobile device, then chances are your OS and/or software is atrocious. Interestingly enough, Android these days is bordering on being atrocious seeing as they appear to be singlehandedly pushing mobile CPU speeds forwards by leaps and bounds (not that this is a bad thing). The boys over at MeeGo on the other hand, have managed to whip up something that is fast, smooth, and responsive on a TIOMAP3630 1GHz CPU. Apples and oranges, or black and white? IE9 is strangely pushed as a selling point – which I would consider “strange” because most people wouldn’t touch IE with a 10 foot pole doused in disinfectant. IE has always had a slightly less than desirable reputation, and it has carried over to the mobile edition – how deserved the reputation is on mobile devices is, well, yet to be seen. Either way, if I did end up with a 710/800, first thing I’d do is scour the (Singaporean) MarketPlace for an alternative browser (and start cursing if one isn’t available). From sleep, press and hold the camera button, and the 710/800 proceeds to wake from sleep, focus, and take a picture. Awesome feature (no, seriously). I would kill to have this on the N9. Cycling while attempting to take a picture on the N9 is suicidal as is. Oh well, can’t win em’ all eh? Snap a picture in Bing Vision of a menu in Dutch, and Bing Vision will conveniently translate whatever bits of the menu that it managed to identify as Dutch text. Cool idea, a little behind time? Could have sworn that there was an augmented reality app available on either Maemo/Android that translated real time without snapping anything. An apparent abundance of 40,000 apps awaits you in the wonderland known as the MarketPlace. Considering the absolute geometric nature of growth of the WP7 MarketPlace, one has to wonder if it’s been a case of quantity over quality here. There are only so�many fart apps that you need on your phone right? Personally, my ideal marketplace places quality over quantity, like the Maemo Fremantle solution (no, not even the N9 equivalent), where the number of apps is somewhat limited, but at least there aren’t 1,000 different fart apps, and 20,000 apps that are RSS feeds. Swanky, no doubt… but then again don’t most devices these days come with some sort of reader for typically used office formats like doc, xls, and ppt? Editing is a definite plus point, but even with that in mind, how often are you going to be creating a doc, xls, or ppt… on your mobile phone? A little more understandable assuming there are WP7 tablets on the horizon… but are there? Whoosh, 25GB of free online storage space? Yes please! This is a little something that nobody is going to turn down especially given that the Lumia 800 only ships in 16GB configuration… but then again, looking at our data quotas over in Malaysia, how useful is online storage for your mobile phone? Apparently 10 hours on 3.5G is possible. I’m not sold. For those with a short attention span, this picture will sum up the entire post for you. Until I have the device in my grubby hands for an extended “Get To Know You” session… Adieu!!! 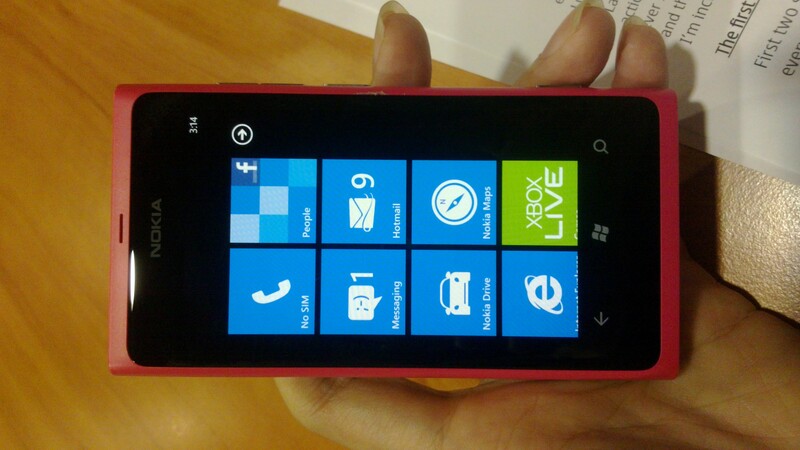 This entry was posted in Uncategorized and tagged availability, lumia, malaysia, nokia, preview, wp7. Bookmark the permalink.